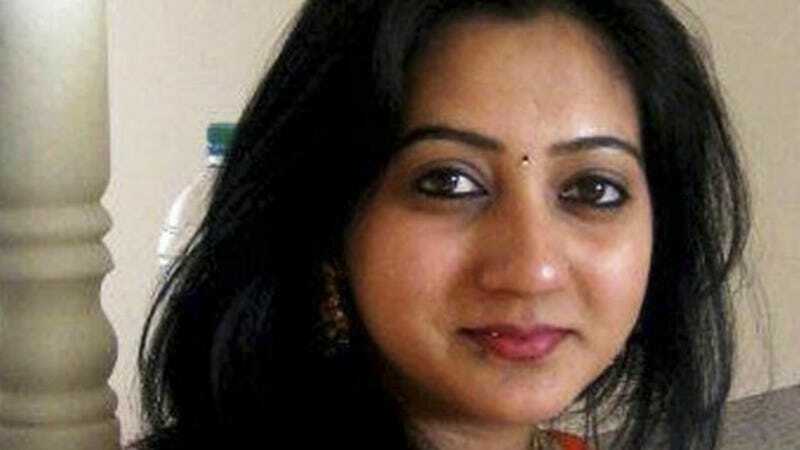 Savita Halappanavar died in an Irish hospital last October, a full week after the 31-year-old dentist came in with back pain and was found to be miscarrying, because doctors refused to remove the fetus until its heartbeat officially stopped. Abortions are illegal in Ireland except in cases where the mother's life might be at risk; why wouldn't the hospital save her? Savita and her husband Praveen were told that a miscarriage was inevitable on the very first day she was admitted at the hospital. But staff denied their repeated requests for an abortion, saying their "hands were tied" because of the law. What a tragic waste. "If what was published today were extracts from the report then all they do is, in some ways, vindicate what my client said from the outset as to the way his wife was treated at University Hospital Galway," Praveen's solicitor Gerard O'Donnell told the Irish Times. The hospital won't comment because the report still has to go through "rigorous fact checking and verification process." It this point, it's hard to imagine any facts that would render their actions defensible. Obviously the larger issue here is that abortion should be safe and legal for all Irish women, not just those who might die, but staffers can't claim the Catholics are totally to blame in this case.